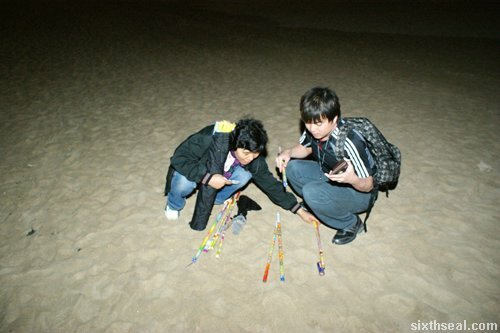 I was bargaining with this aunty who approached me on the beach to sell me fireworks and managed to get her to sell me one which costs 5,000 won for 3,000 won. I bumped into her again when I was getting it from the street vendor and told her I’m gonna buy it for 2,000 won this time. It was pretty funny though…and I might have inadvertently triggered off a turf war between the beach vendor and the street vendor. Heh!